"saving the world with slash"
Five crazy women, quirky academics, writers, lovers of Smallville (in spite of itself) who get together weekly for potluck and fannish conversations. 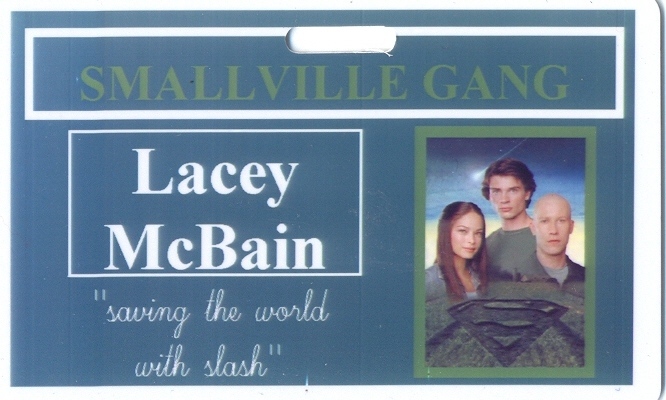 We are otherwise known as The Smallville Gang. Lacey's husband came home one day and presented her and the visiting privatetentacle with a note that said "sticky man. press". We immediately said, "That's a great name!" Hubby dutifully turned the paper over to reveal the rest of the note: "Please check the sticky man. press" - Mr. McBain is a pilot. The note was asking him to check the manifold pressure gauge on the plane because it was sticking. But he knew what we'd think. Therefore, since he enabled, we can legitimately claim "this is all his fault".